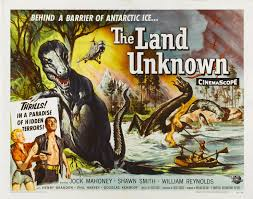 The Land Unknown is a delightful monster film from 1957 that has all the bad special effects we have come to know and love from this era…at least from our CGI-spoiled perspective. Basic plot: Group of scientists make an expedition to Antarctica. Four of them take a helicopter to explore a strange phenomenon they heard existed from a previous expedition…a warm lake near the South Pole. A female reporter, Maggie, tags along. Once the helicopter gets going, it’s immediately called back due to foul weather, but on the way back it is forced to land in a crater way below sea-level. The temperature goes tropical and when they land, they discover a land of dinosaurs and a man named Hunter who survived a previous crash. Blah, Blah, Blah…pretty standard stuff. 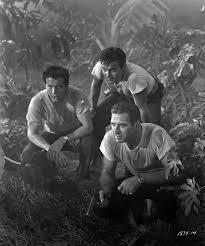 Maggie's self-defense mechanism in this film is to pass out and wait to be rescuedevery time she sees a dinosaur. There’s lots we could talk about in this little gem, from as complex as sexist attitudes and male rights to ownership of females, or as simple as why the hell they’re running around barefoot … but I want to talk about “Aphorism”. An aphorism is a short, concise statement made casually that expresses an opinion thought to be a universal truth. Man in T-Rex costume attacking a toy helicopter! Genius! This is Hunter and nowhere in the movie is there any explanation as to WHY he has an empty wicker birdcage in his cave. I guess I'll have to catch the sequel for all the unanswered questions like that one! Hunter then says, “I don’t need your pity or your help.” And Commander Roberts lays on him an awesome aphorism: “We all need pity and we all need help.” Well, it’s such a moving aphorism that Hunter gives them the map to the wreckage, and blah blah blah they save themselves. Here's the Id, Ego, and Superego of the movie. In respect to the politics of the 50s, this little aphorism takes on a greater meaning. What with fears of atomic bombs and race riots and school integrations permeating the zeitgeist, the thought of a little pity and help would have come across as very comforting. Rick, and Will and Holly...on a routine expedition..." This guy looks nothing like "Grumpy" and where the hell are the Sleestak and Pakuni? Not Nessie in Loch Ness...more like Messy in Loch Mess! This movie is not excellent, but it is charming with its robotic dinosaurs, man-inside-the-T-Rex costume, and its live monitors passing for dinos. Interesting trivia fact is the production company spent so much money on the mechanical dinosaurs that they had to film the movie in Black & White. There’s something here about man’s strange desire to explore the unknown…after all it is Man who is the Land Unknown…perhaps even unknowable. A good aphorism can go a long way in helping resolve a plot.